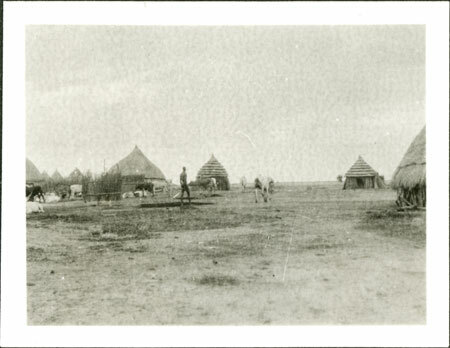 To the left can be seen windbreaks and cattle of a camp, probably near permanent water such as the Sobat River, with a cattle byre (luak) and sleeping huts with layered thatch behind. It is probable that this location is one of the Nuer Lou dry season camps on the Sobat River. Note on print reverse ms pencil - "4 106 "
Morton, Chris. "Nuer homestead and cattle camp" Southern Sudan Project (in development). 03 Jan. 2006. Pitt Rivers Museum. <http://southernsudan.prm.ox.ac.uk/details/1998.346.106.2/>.